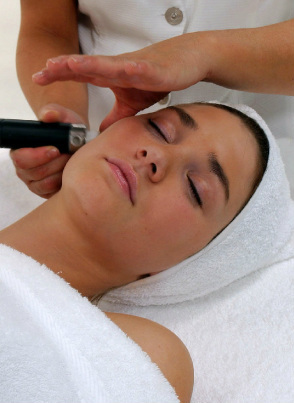 Using hundreds of tiny diamonds, this gentle treatment removes two layers of dead skin cells from the face. elastin and collagen fibres are simultaneously stimulated by a controlled suction to encourage cellular renewal, resulting in visibly smoother, softer, firmer and more radiant skin, even after one treatment. How ever a course of treatments is often recommended to achieve maximum results. ~ Fine lines and wrinkles including the delicate eye area. ~ Sun damaged, uneven and thickened skin. ~ Acne prone skin, a safe and effective treatment for acne. ~ Congested skin including blocked pores and blackheads. ~ Enlarged pores and dull skin. ~ Superficial age spots and pigmentation.